-SG- Some while back we had a posting about the oil pump fitted to the 1924 16H belonging to Peter Thomson in New Zealand. 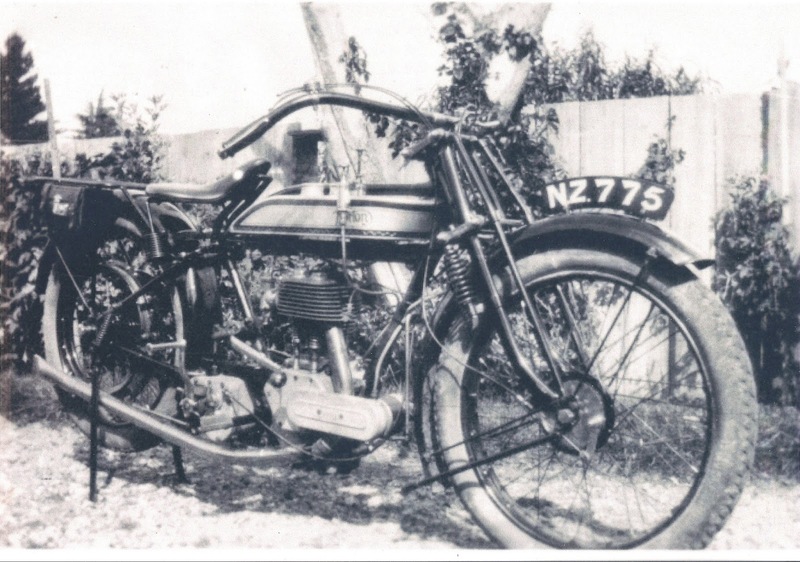 This machine was bought many years ago by Peter's father from the original owner and for some reason not worth spending time on, we have never shown the original photo of the bike as delivered (at which point it did not have a mechanical oil pump atall). The period photo provided by Peter shows a lot of detail including black painted handlebars - so don't assume they were always nickel plated at this period! Also worth pointing out that the kickstart lever is slightly cranked - giving it adequate clearance past the extended exhaust pipe. Some time back Peter looked up the details of this machine while he was in UK and it appears to me that they might contain an error! They show it as being despatched in March '24 to the Belgian Norton agents, Breslau. If this information is wrong, it may be that some of the rest of the despatch book infomation is also wrong and should have been entered against another machine altogether ... at this stage, not easy to be sure, but it seems unlikely to me that a machine going to New Zealand in 1924 would have been shipped without tyres or saddle as stated in the records! These also say: 'Sep O' which may well stand for 'separate oil tank,' (unless anyone has any better ideas) and, as the photo shows, this was not the case with this machine.